I've just been through website hell trying to purchase train tickets on the Spanish rail site Renfe.com. It's not that I wasn't warned - the internet proliferates with cries of woe from hopeful non-Spanish rail travelers who are up until all hours of the night clicking "Complete Transaction" only to repeatedly and maddeningly get the error message G001 with no other explanation. Numerous laypersons offer excruciatingly detailed online advice about how to navigate the treacherous site with cautions such as: "The website is a bit surreal," and ". . . nothing seems to be what it really is," and "error messages come from nowhere," and "You just have to persist." So persist I did. I followed all the navigation suggestions to the letter: I used Firefox browser. I logged on exactly 62 days before my planned rail trip from Madrid to Seville. 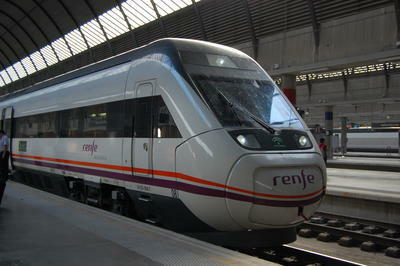 I did not switch to English on the Renfe site until the second screen. I input a nonsense 9-digit telephone number. I disregarded the Tarjeta Tempo boxes. I carefully input my credit card information and . . . wham, error code. Repeatedly. Maddeningly. For five days I did this over and over for hours, trying every credit card in my arsenal, trying my name, my husband's name, my husband's name with middle name, my name with maiden name. (The Spanish evidently use two surnames, and this can be a problem for foreigners filling out Spanish online forms.) Then, *blammo*, after probably 30-something tries, the purchase magically went through. I did a happy dance in my living room. Why endure all this frustration to buy Spanish rail tickets on Renfe.com when I usually purchase my rail passes and tickets through the perfectly competent and user-friendly Rail Europe website? Because I saved $245, that's why! As I've posted before, it's rare, but occasionally there are substantial savings to be found by booking directly on a country's rail website rather than on Rail Europe. Not for all routes necessarily, but some. It just pays to check first, and in this case it really did pay. So happy to hear your persistence paid off. I hope you have a great trip.